".....But I want to warn them that I am so strong. They shouldn't think that I am saying this from a weak position. I am a leader and therefore I must show leadership as I speak to the large masses who are going to read the message that you are going to give. Therefore, what I have said, I have said it with responsibility on my shoulder. I am able to defend every statement that you are going to write down. I would rather go down saying the right thing than be glorified for embracing things which will not do any good to the nation. The Mwanawasa legacy must be carried forward by honest people. If they are not, we will reach a separation stage...."
".....There is a clear attempt to subvert democracy by going to provinces and asking them to issue meaningless statements devoid of substance endorsing Rupiah because he represents continuity. What continuity? We saw these tactics when Frederick Chiluba wanted to impose his third term upon our country; when Mwaanga together with other shameless charlatans were singing Chiluba's praises and supporting his third term fully knowing that it was immoral, it was a cheat, a deception, a manipulation of our people. It is also clear that those championing Rupiah's succession bid are people who in one way or another did not get what they wanted from Levy. Some of them, like Mwaanga and Chitala, were people Levy had dismissed from his government. We all know what Arthur Yoyo stands for! We also all know what Mwaanga stands for and why Levy had sacked him from his government. Wasn't it because of lies and dishonesty? Are these people one can expect to be truly representing or championing the cause of Levy's legacy? The presence of Mwaanga, Chitala and other charlatans like them in Rupiah's campaign team speaks volumes about what Rupiah stands for and where they want to take the country. It's really not in the direction of Levy and his legacy but in the direction they are all known for...."
"...the MMD should learn something from the [USA] Democratic Party. Those who will not be elected should realise that at the end of the day, they are all members of the same party, which will be pitted against opposition parties that are determined to get to State House. Those who will not be selected will do well to mobilise their supporters to rally behind the party candidate in order to further the interests of their party..."
I am not sure on what basis the editor reaches the conclusion that it is in the "national interest" for MMD to remain a single entity. It strikes that the promotion of MMD unity goes a little too far here for a paper that is supposed to represent the interests of the nation. For one thing I think of many social costs and benefits of an MMD split. I am just not sure how he has balanced these out. I cannot wait until a more bold President can truly unshackle these national papers from state control. Tax payers should not be paying to keep such irrational assessments in circulation. I say "bold" because clearly the decision to privatise the Times and Daily would come with a significant cost to the incumbent. They would lose one of their principal forms of state control. Incidentally, this is what actually puzzles about the liberalisation policies of the 1990s. They sold everything except that which mattered most for people's freedom - the media. But I am ranting now, so I'll stop here. Too many weblinks are forwarded to my inbox, and I can't put them all on the blog! So I have decided to create the "linking Zambia" tag. All interesting Zambian links can be found there. Worth checking out the Zambian Chronicles. A quite extensive website covering many areas, touching on international topics as well. I was also recently forwarded the Zed Mania website, which apparently is intended as "a social network for Zambians and their friends around the globe". If that is not enough, you can also have a go at Zambia Konnect which aims to do exactly what it says on the tin : "ZambiansKonect is a social networking website that connects you with other fellow Konectists around you". 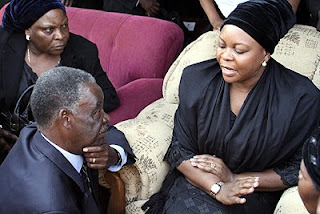 Maureen Mwanawasa (former First Lady) lauches a tirade against the kneeling Michael Sata (leader of the Opposition) for attending the presidential body viewing in Chipata (Source: Richie's World). Meluse Kapatamoyo provides "a view from outside" on the leading contenders for the top job. No doubt much of the material has already made its way some of your email boxes, but the article does contain one or two new revelations (or creations ?). The ruling Movement for Multi-party Democracy (MMD) is headed for a major split following the death of Mwanawasa and the forth coming presidential by-elections. So far, it is unclear as to who the party will nominate for the presidency but opposition political parties have already announced their candidates. The MMD held its National Executive Committee (NEC) meeting on August 21. The NEC resolved that since the nation will be holding presidential elections soon, it's imperative that a presidential candidate be immediately picked without necessarily going to the national convention, the body mandated to elect party office bearers, including the president who in turn stands on its ticket. Suffice to say that even President Mwanawasa was not chosen through the laid down MMD electoral process but was merely chosen by the NEC when he contested the 2001 general elections. The party has found itself in unfortunate circumstances where both the position of MMD President and Vice-President is vacant. These positions, in accordance with MMD constitution, can only be filled by its convention. The NEC has opted to pick only a presidential candidate for the November elections. The position of president and vice will remain vacant. By September 5, 2008, the party would have chosen a person who they think would carry on Levy Mwanawasa's legacy. Several statements, arguments and suggestions are being made throughout the country and so far, Finance Minister Ngandu Magande, former Works and Supply Minister Ludwig Sondashi, Health Minister Brian Chituwo, Constitution Review Commision (CRC) former chairman, Willa Mungomba, and former Vice-President Enock Kavindele have filed in their documents for consideration. Others being speculated include the Acting President Rupiah Banda and the former First Lady Maureen Mwanawasa. Former minister in Mwanawasa's cabinet, Dipak Patel, told the media recently that Magande was more capable to carry on Mwanawasa's vision and this seemed to swing the balance of power with more voices coming in to his support. In the midst of this uncertainty, who has a greater chance of being the MMD presidential candidates? Rupiah Banda, 70, Acting President. RB, as he is fondly called, was called out of retirement by Mwanawasa. Banda is said to have delivered an electoral bequest of Eastern Province for Mwanawasa and the MMD. He was rewarded with the position of Vice-President after the 2006 elections. He has wide influence among chiefs in eastern province although he still has some connection with the United National Independence Party of the Kaunda era. An experienced diplomat and businessman, time has found him where he ought to be. He has guided the nation during the illness and death of Mwanawasa and remains instrumental during the transitional period. If he won the MMD presidency, he could be a strong candidate against PF leader Michael Sata. He is courting a seemingly political lightweight Bwalya Chiti, a royal from the Bemba Royal Establishment to be his vice. Bwalya Chiti is said to be a vicious backroom that has resources at his disposal from ICT companies that he recently sold. The combination is already being referred to as The Dream ticket. This ticket is aimed at creating a formidable force against the resilient Patriotic Front (PF) leader, Michael Sata who commands wide political support in Northern, Luapula, Copperbelt and Lusaka based on the 2006 general elections. If selected by the NEC, Rupiah Banda can legally use extensive state resources such as ZAF helicopters, media coverage and government motor vehicles in the campaign, without repercussion, since he is Acting President. The MMD on the other hand regards RB as an outsider. He is yet to renounce his UNIP membership and some argue that he does not qualify to be an MMD presidential candidate. He is termed as a UNIP member. He has no constituency since he was only nominated and his popularity remain untested. He was born in Gwanda, southern Zimbabwe , where his Zambian parents were migrant workers. In one of his last meetings, Mwanawasa stated that he wanted a younger leader than himself to succeed him. This "disqualifies" Banda and 61-year old Magande against Mwanawasa's wishes. Mwanawasa was 59 years. Banda is a mere trustee in the party and his juniors in government are his party seniors. He seems to be reacting terribly slowly by remaining mute to events happening around the campaign from his opposing camps such as the First Lady, Maureen Mwanawasa, Magande and others. Despite the odds pitted against her, Maureen seems resolute to contest the position though party spokesperson Benny Tetamashimba argues that the First Lady will not rescind her earlier position that she would not contest the elections. She seemingly wants to use a sympathy vote by claiming that she is best suited to take-over from her husband and complete the vision she shared with her husband. She is most likely going to put together Mwanawasa's vision as "theirs". A privately owned newspaper, The Post of 24 August, 2008 carried an editorial praising her and urging her to respond to the call to honour her husband's legacy by sharing what the late president envisaged for Zambia. ''If for a moment, she thinks that she is going to mourn, weep and cry like the rest of us and then attend to her husband's legacy later, there will be no legacy...Maureen has no choice but to make herself available, whenever needed, to make clear what her husband's legacy is,'' The Post said. Despite the tradition and culture sensitivity surrounding Maureen as widow, there is an attempt by some sections of the MMD to continue "milking" the Mwanawasa family, a common practice among cadres who do not believe that there is an end to everything. They see the First Lady as a saviour — nothing else. He is seen as an establishment candidate with support from a wider section of the society especially the business sector. The finance minister and former Africa Carribean and Pacific countries (ACP) economist is credited with stabilising the exchange rate, bringing down inflation rate and has helped bring in foreign direct investments and shore up donor support to Zambia. He has aligned well with his long-time colleague and friend from the UNIP government, Bank of Zambia Governor, Dr Caleb Fundanga, to manage the economy. Magande's deputy and Mwanawasa's nephew, Jonas Shakafuswa has publicly supported him. Magande joined Mwanawasa as his Finance Minister, when Emmanuel Kasonde was fired. Magande was the late United Party for National Development (UPND) leader Anderson Mazoka's economic advisor and has suffered the tag of "outsider". His constituency seat is in Chilanga, Lusaka , and it is doubted if he can bring an electoral win even to his area of origin-- Southern Province. His past attempts to stand as an MP in the Southern Province failed but his win of Chilanga seat in 2006 was strongly disputed by his opponents. Evidence of serious and glaring acts of rigging and fraud were cited. The Supreme Court has, however, recently ruled that Magande was duly elected. It is feared that the support he received from Dipak Patel, a non-MMD member, but a very influential person especially among the business elite, merely represents a powerful but unelected clique known to control and shape policies of this country in the Mwanawasa presidency. He remains the clear front-runner to win this election although his age, health and his foreign policy will deter him from winning the presidency. His decision to reconcile with Mwanawasa, when he returned from South Africa from his medical treatment, has put him in good stead and as a leader with far sights. Despite being popular in the urban setting of Lusaka and the Copperbelt, it remains unclear if he would win in Southern, Central, Western, Eastern and North-western provinces and for him to concentrate on the Copperbelt, Lusaka, Luapula and Northern provinces may not give him a clear victory. On the foreign policy, after those alarming statements by his policies on China , Zimbabwe, Taiwan, and his other central policies seem to have received subtle revision. He has since dropped public rhetoric of "anti-Chinese and anti-Indian" approaches seemed to have gone under revision. His harsh treatment of the 26 MPs that rebelled against him has earned wide criticism. Many wonder how he is capable of forgiving and reconciling with his arch-rival and arch-enemy, Mwanawasa and yet refuse to bring to the fold his own MPs, in the name of discipline. This has sent a chilling effect and reinforced the fear of dictatorial tendencies. The 26 MPs have, however, no effect on the coming elections since no constituency is under election. This is a presidential election that can allow Sata to use party structures other than MPs. His strong relationship with the Catholic is beneficial as he quickly picks the church social struggles and issues them as his. Sata, Mwanawasa and other leaders were the architects of the National Constitution Conference, but when the Catholic opposed it, he quickly joined in and rescinded his earlier position. Zambia is currently in the process of enacting a new constitution that is expected to address important issues missing in the current document through a delegated body, acting through a piece of legslation, drawn from a wider selection of society. With more than 400 members, the NCC will deliberate and formulate a draft constitution that will later be passed on to parliament for further debate and scrutiny before adoption. HH recently cooperated with Sata and held a joint and well attended public rally against salary increments for constitutional officers. They were joined by civil society groupings and trade unions. At this rally, Sata presented HH as his running mate and showed as though an electoral pact had been sealed. There was a wild cheer from the crowd. The alliance presented itself as sure winner with safe guards to beat and insulate against state riggings. Many held their breath. Sata did not seem to treat HH as his colleague and partner. He kept on referring to HH as "calculator boy", "computer boy", "under five" combined with good praises for HH's decision to join hands to defeat the MMD. Many feared that the alliance would not hold. It wasn't founded well like the Forum for Democracy and Development (FDD), UNIP, and UPND which formed United Democratic Alliance (UDA) in the 2006 elections. It was preceded by shallow discussions without depth and wide consultation. The alliance that never was, quickly collapsed.Many saw that this was the quickest way for HH to raise his profile and have a fair chance to be president some day. With the demise of Mwanawasa, the UPND quickly announced that HH would contest the elections and so far campaigns by his party cadres have started. Many people think that HH is a reasonable leader who at one time Mwanawasa had invited to run government together but he declined. He is seen as a potential young leader who may just surprise many if the MMD disintegrates. There is absolutely no reason why he can't be a good president but the stigma that surrounded his coming into politics, when Mazoka died still haunts his party, which is sometimes referred to as tribal. He is respectable politician whom most people hold in high esteem. However, because he has failed to run the Heritage party and also has not opened up to work with other politicians, he is seen as a loner. He, however, has a great chance of becoming a president if he worked with parties like the MMD and the UPND. He also has a following among Christians and teachers whom he associates with at different levels. He is also seen as a Mr Clean. Although it would be too early to predict the outcome of the presidential by-elections, history is being rewritten in the Zambian political scenario. There is likely to be a surprise but looking at the past, one of the above candidates may scoop the post. We just have to wait and see. Malawi's government has now implemented the ban on the private trading of maize we discussed here. The move is apparently designed to tackle food hoarding by smallholder farmers who the government accuses of speculating on further increases in prices in the future. The new rules ensures that Agriculture Development and Marketing Corporation (ADMARC), is the sole buyer and seller of maize in the country. Government has fixed the price at which ADMARC will buy and sell maize: the state marketer will pay farmers and traders K2,500 ($17.86) per 50kg bag, and sell it at K52 ($0.37) per kg, or K2,600 ($18.57) per bag. Private traders have been paying farmers and other suppliers : K3,000 ($21) per 50kg bag and reselling it to the public at K3,500 ($24.55) - K4,000 ($28). Which begs the question, on who the losers are? It can't be the private traders. The margin they get seems broadly similar to the government and sometimes less! Its definitely the farmers in the long term (and smallholder farmers are exactly the poor rural dwellers!). In short, it does not make sense what the government is trying to do, but urbanites are happy. Its always a distribution issue, the poor rural dwellers far removed from centres of power, are again at the mercy of angry urbarnites. But what the poor urbanites forget is that things will not get back with this particular measure, infact it can only get worse! A series of fascinating video clips following Chemonics as they work with the government on the Zambia Threshold Project (a project co-sponsored with USAID). The ZTP is being taken forward by the government to help limit the scope for administrative corruption, reduce the cost of doing business in Zambia, and foster economic development to benefit a wide cross-section of the population. The search for an MMD presidential candidate is becoming crowded, with the latest tally including Ronnie Shikapwasha (Minister of Home Affairs) and former Republican vice-president Nevers Mumba. The process has also brought to the forefront two issues that have come to typify MMD's 17 year dominance of Zambian politics - corruption and tribalism. ....MMD national secretary Katele Kalumba has revealed that one official aspiring to stand as the party’s presidential candidate is spending colossal sums of money to buy support contrary to the code of conduct. Ironic that Dr Kalumba, who is also facing corruption charges in the courts of law, and who many have campaigned against not to stand on those same grounds (and so far he is not), should be the one to reveal this to us and also spearhead the MMD purge. We could read this to mean things are changing, or corruption is so rampant that even the devil would be scared! Its an open secret that Zambians vote on tribal lines , but when people's voting patterns is accentuated by leading figures in the ruling party, through the creation of Kapwepwean "tribal alliances" then its not good for national unity (incidentally Kapwepwe was creating tribal alliances to encourage competition to Kaunda's hegemony, the new intra-MMD alliances appear geared to suppressing free choices). It appears this is the path being taken by leading MMD contenders, as the struggle between Magande (Finance Minister) and Banda (Acting President) now takes on serious tribal undertones. I would add as a footnote, that its not just tribalism, there's also some sexism being used. One only has to read between the lines of Tetamashimba's latest pronouncement that the former First Lady should not be tempted "into joining politics at the time that she has lost her husband". The implication clearly being that bereaved women can't cope with political pressure. Would we say the same if the roles where reversed? That is not to say the country should openly embrace Maureen's candidature. On the contrary, due to what I call "leviathan nepotism", careful assessment is needed. As we discussed here, its well documented that for all Levy's achievements, he practised significant nepotism in the hiring of civil servants and ministers. Nepotism is just as bad as corruption, and may be even worse. It weakens lines of authority and promotes incompetent people over those who are better qualified, inevitably turning the Executive Branch into a personal toy. Zambians would have to be sure Levy practiced nepotism alone, without the wife's knowledge or influence before giving Maureen the presidency. But thats what election campaigns are for. To discuss people's legacies and what they have achieved. We certainly should not prevent people from contesting positions because they are bereaved wives. "......The cost of finance was one of the tasks that president Mwanawasa set out to reduce, the private sector was lamenting about the huge costs incurred in production. To address these concerns, the government introduced the Private Sector Development (PSD) reform programme, which led to the merging of five investment promotion institutions to create the Zambia Development Agency (ZDA), promotion of private public partnership (PPP), reformation of institutions like the Immigration department, the Patents and Companies Registration Office (PACRO), review of investments licences and labour reforms among others......"
The cost of finance? A Freudian slip for sure. What they wanted to say was "the cost of doing business", of which the cost of finance might be one factor. As it turns out the slip probably illustrates the problem with their assessment - it too onesided. For if there's something that was not fully tackled by Levy, its precisely the high cost of finance! A friend tells me that these are the men and women whose choice of the next MMD presidential candidate, may significantly constrain your choice for the next President of the Republic of Zambia. But there's another reason why you should know them - these may well be your future cabinet, atleast in an early post electoral phase. As the MMD NEC searches for a candidate to stand against the opposition, prospective candidates will woo MMD NEC members with many promises. Not all of those promises will be about good governance. Many of them will be about personal rewards e.g. cabinet posts, money and other things. Its therefore possible that many from this group of 38 could emerge quite influential post the elections, should the MMD win the Presidential by-elections. You might want to keep that in mind, as you watch the drama unfold. Worth checking out the new Zambian Issues blog. .....According to experts, cellphones are particularly important for Africa due to a lack of some other technologies. Visiting African political expert at Indiana University, Sheldon Gellar, said cellphones were much more accessible than the internet in most parts of Africa, and therefore had greater potential to influence transparency. "Internet provides groups in society with means to communicate, organize and obtain good information which is not controlled by government -- but, only a tiny percentage of African populations have access to internet." Just this month CNN reported dramatic increases in cell phone usage in African nations. In the Democratic Republic of Congo, for example, there are just 10,000 fixed telephones but cellphone subscribers have soared to more than a million in the last five years. Gellar told CNN the key benefit of cell phones was that they allowed independent media, especially radio, to provide accurate coverage of elections and make it more difficult for ruling parties to cheat and get away with it. "During the 2006 local government elections in Senegal, Radio Sud used reporters and correspondents with cell phones to call in what they saw. I remember hearing one reporter describing how a local party boss was illegally taking a ballot box on his truck from the polling station. This was reported live as it was happening." Civilians and independent election observers outside the media have also taken advantage of cell phones to monitor elections. Bob LaGamma, executive director of Council for a Community of Democracies, said the 2007 Nigerian election was another example of technology being used effectively. LaGamma described a technique of "parallel reporting", whereby independent observers spread news of local vote counts and any irregularities. This technique was also used in the Zimbabwe elections this year, which he said caused Robert Mugabe to delay announcement of election results. ....The mountain guides of Dâureb have joined some 50 other communities in a local initiative which the Namibian government has encouraged since 1995 -- to devolve authority over wildlife and tourism to local residents. The Namibian government, in a report published by the tourism ministry, said the project is "effective as a rural development strategy ... generating income for local communities, and providing new skills and expertise." On the whole, conservancies provided an income of 26 million Namibian dollars (over two million euros, three million dollars) in 2006, compared to 600,000 Namibian dollars in 1998, of which more half comes from tourism and trophy hunting. The First Lady, widely seen by some MMD supporters as the natural successor to Mwanawasa, has clashed with the Leader of the Opposition, widely seen by some as the front runner. Read more here. The African brain drain is not large enough to have much effect on Africa’s skill gap relative to the rest of the world. Since other regions had a larger brain drain, the skill gap between Africa and the rest would actually be larger in a counterfactual world of no brain drain with the same amount of skill creation. The gains to the migrants themselves and their families who receive indirect utility and remittances more than offset the losses of the brain drain. According to one of our calculations, the present value of remittances more than covers the cost of educating a brain drainer in the source country. Brain drain has a positive effect on skill accumulation that appears to offset one for one the loss of skills to the brain drain. Hence it is not surprising that we fail to identify any negative growth effect of the brain drain. Although some of our exercises are reliant on special assumptions and shaky data that require further investigation, we conclude based on what we can know in this paper that the brain drain is on balance good for Africa. Readers interested in these issues, might also want to cast their eyes on a previous blog on Benefits of Foreign Education? Pranab Bardhan argues in his latest piece in the Financial Times that in order for markets and capitalism to work, it requires a significant input of other "social forces and movements for civil and economic rights". The Chinese case in particular is reviving a hoary myth of how particularly in the initial stages of economic development authoritarianism delivers much more than democracy. This is also backed by the memory of impressive economic performance of other East Asian authoritarian regimes (like those in South Korea and Taiwan in the recent past). The lingering hope of democrats had been that as the middle classes prosper in these regimes, they then demand, and in the latter two cases got, the movement toward political democracy. But the relationship between authoritarianism or democracy and development is not so simple. Authoritarianism is neither necessary nor sufficient for economic development. That it is not necessary is illustrated not only by today’s industrial democracies, but by scattered cases of recent development success: Costa Rica, Botswana, and now India. That it is not sufficient is amply evident from disastrous authoritarian regimes in Africa and elsewhere. Even if we were not to value democracy for its own sake (or regard it as an integral part of development by definition), and look at it in a purely instrumental way, it is worth reiterating the several advantages of democracy from the point of view of development. Democracies are better able to avoid catastrophic mistakes, (such as China’s Great Leap Forward and the ensuing great famine that killed nearly thirty million people, or a massive mayhem in the form of Cultural Revolution), and have greater healing powers after difficult times. Democracies also experience more intense pressure to share the benefits of development among the people, thus making it sustainable, and provide more scope for popular movements against industrial fallout such as environmental degradation. In addition, they are better able to mitigate social inequalities (especially acute in India) that act as barriers to social and economic mobility and to the full development of individual potential. Finally, democratic open societies provide a better environment for nurturing the development of information and related technologies, a matter of some importance in the current knowledge-driven global economy. Intensive cyber-censorship in China may seriously limit future innovations in this area. All that said, India’s experience suggests that democracy can also hinder development in a number of ways. Competitive populism– short-run pandering and handouts to win elections– may hurt long-run investment, particularly in physical infrastructure, which is the key bottleneck for Indian development. Such political arrangements make it difficult, for example, to charge user fees for roads, electricity, and irrigation, discouraging investment in these areas, unlike in China where infrastructure companies charge full commercial rates. Competitive populism also makes it difficult to carry out policy experimentation of the kind the Chinese excelled in: for example, it is harder to cut losses and retreat from a failed project in India, which, with its inevitable job losses and bail-out pressures, has electoral consequences that discourage leaders from carrying out policy experimentation in the first place. Finally, democracy’s slow decision-making processes can be costly in a world of fast-changing markets and technology. The hopes of democrats relying on the middle classes in authoritarian regimes have not always borne fruit. Latin American or South European history has been replete with many episodes of middle classes hailing a supreme caudillo. The police state in China shows no signs of loosening its grip soon, despite the spectacular progress in the opening of the economy. While there has been some relaxation in controls over individual expressions of thought, and some open middle class grumbling over pollution and forcible acquisition of property, the state never fails to clamp down on political activities that have even a remote chance of appearing to challenge the monopoly of power of the central authority. Most people in the Chinese middle class are complicit in this in the name of preserving social stability, as long as opportunities for money-making and wallowing in nationalist pride keep on thriving. So markets and capitalism will not do their political cleansing job automatically. On the contrary, markets often sharpen inequality, and the resultant structures of political power, buttressed by corporate plutocrats and all-powerful lobbies, may even hijack or corrupt the democratic political process, a phenomenon not unknown in some industrial democracies. Thus both for democracy and development other social forces and movements for civil and economic rights for the common people have to be pro-active and eternally vigilant. One of the most hotly debated issues prior to the untimely death of President Levy Mwanawasa, was on whether the nation was going to go through a Presidential bye-election or general election. The following article published in the Post last week clears the constitutional mud (and comfirms the position that this blog has held from the very beginning). Justice Minister George Kunda yesterday assured the nation that all constitutional and legal provisions are being complied with following President Levy Mwanawasa's death.....Giving explanations on the constitutional provisions and the way forward in the succession process following the death of President Mwanawasa on Tuesday, Kunda assured that the presidential by-election would be held according to the Constitution. He observed that following President Mwanawasa's death, numerous questions were being asked as to the present legal position of the government and the steps that need to be taken to move forward. "It has, therefore, become imperative that I explain for the benefit of members of the public, who may have difficulties appreciating the legal position, the relevant constitutional provisions on who takes over when the President dies, the process leading to the assumption of office of the new President and related issues," said Kunda at a media briefing at his office after a Cabinet meeting. "Under Article 38 (2) of the Republican constitution, if the Office of President becomes vacant by reason of his death the Vice President, or if the Vice President is absent or is unable due to physical or mental infirmity to discharge the functions of his office, a member of the Cabinet elected by the Cabinet shall perform the functions of office of President until a person elected as President assumes office." He explained that Article 38 stated that if the office of President becomes vacant by reason of his death or resignation or by reason of his ceasing to hold office by virtue of Article 36, 37 or 88, an election to the office of President shall be held in accordance with article 34 within ninety 90 days from the date of the office becoming vacant. "Ninety days refers to ninety calendar days. In this case, the ninety 90 days began to run on the 19th August, 2008 when President Mwanawasa died. The period of ninety days includes Saturdays and Sundays as well as public holidays. It also includes the days of national mourning," Kunda explained. "After due consultation between the Ministry of Finance and the Electoral Commission of Zambia, the date for the Presidential election will be announced in accordance with the provisions of the Constitution and Electoral Act." Kunda explained that since the death of President Mwanawasa on Tuesday, Vice-President Rupiah Banda took charge of the office of President in an acting capacity pursuant to Article 38 (2) of the Constitution. "Neither the Constitution nor the Official Oaths Act provides for the Oath of office for an acting President," Kunda explained. "The Vice President Banda already subscribed to an oath of Office as Vice-President on assumption of that office. He becomes Acting President by virtue of his being substantive Vice-President. Accordingly, there is no legal requirement for the Vice-President to take an oath as Acting President." He said Vice-President Banda would be Acting President until a person elected as President assumes office, within 90 days after the death of the President. He said acting President Banda could perform all the functions of the President except he could not dissolve the National Assembly nor could he, without the advice of Cabinet, revoke any appointment made by the President. He said in all other respects the Acting President had full presidential powers. He said the death of a sitting President did not entail a dissolution of Parliament, therefore there would be no general elections but just a presidential by-election. Kunda further explained that whoever would be elected as President during the presidential by-elections would hold office for the remainder of the period before the next general elections in 2011. He said the current National Assembly which was elected in 2006 shall stand dissolved at the end of five years of its life in 2011. "General elections will then be necessary. This is because Article 88 (7) states that: 'whenever the National Assembly is dissolved under this article, there shall be Presidential elections and elections to the National Assembly and the first session of the new Parliament shall commence within three months from the date of the dissolution'," Kunda explained. "For the avoidance of doubt, elections to be held following dissolution of the National Assembly will include elections to the office of President even if the person to be elected will have served for only three years." Kunda dismissed assertions that the government was trying to manipulate the Constitution so that Vice-President Banda could continue acting as President until 2011. "We have no choice as a people of Zambia, we have to hold these elections; constitutionally we are bound to hold these elections and of course cooperating partners sometimes have supported us in holding these elections. So we believe in good governance, we believe in constitutionalism, therefore we are going to hold these elections within 90 days," said Kunda. Portfolio has an interesting interactive online map with gas prices around the world. Zambia has the highest gas prices in Africa. (Thanks to Random for the tip!). "Politics is a struggle for power. In a democracy, the struggle takes place within a competitive framework regulated by rules, principles, norms and conventions. In much of African politics is personalised and transformed into a means of acquiring personal wealth and power, thus those in power and position of leadership do all they can to keep others out. Hence the struggle between leader resolve itself into one for the price of power and not as a competition for better policies and solutions to the peoples' problems....And this is what we must at all costs avoid in the MMD. Some of the fundamental legacies of President Mwanawasa are the observance of the rule of law, the fight against corruption and empowerment of our citizens. Keeping this in mind, I was shocked to hear from some very senior people in government and the MMD talk about a possibility of amending the Constitution that would allow Vice-President Rupiah Banda to continue as President till 2011. This is not only absurd but dangerous." The Cabinet has extended the period of mourning for the Late President of the Republic of Zambia Dr. Levy Patrick Mwanawasa to 21 days. The decision was made at a Special Cabinet meeting held at Government House in Lusaka today, Thursday, (21st August 2008). The Cabinet considered operational and logistical requirements including the transportation of the body from Paris to Lusaka, the taking of the body to Provincial Centres in Zambia and for the burial to coincide with what would have been the late President’s 60th birthday on 3rd September 2008. Upon the body’s arrival at Lusaka International Airport, there will be a Guard of Honour and a Presidential Salute. The body will thereafter be transported to Mulungushi International Conference Centre where it will lie-in-state. Between Monday, 25th August 2008, and Friday, 29th August 2008, the body will be taken to Provincial Capitals and on return to Lusaka will lie-in-state at Mulungushi Conference Centre up to 2nd September 2008 and thereafter the body will lie-in-state at State House until the burial ceremony on Wednesday, 3rd September 2008. Close relatives of the first family will gather at the residence in State House. Members of the public will gather at the Lusaka Show Grounds during the period of mourning and those wishing to pay their last respects will do so at the Mulungushi International Conference Centre and in the Provinces. A detailed programme of the state funeral will be published in the media. Some suggestions in The Times that the British government and its partners may be willing to fund the election. Holding the presidential elections within 90 days is certainly going to be challenging (or rather 88 days now, as the 90 days is triggered the moment the seat becomes vacant). The financial cushion might help, though I suspect the Electoral Commission of Zambia will need more than money. Zambia will need as many election monitors as the world can give us, if the legitimacy of the vote will not be questioned! Especially this one will be a very close contest if the Opposition can unify around a single candidate, as it appears the case. One also hopes that hapless ECZ is busy organising the machinery, even as I write, and not burying their head in the sand. There's also the small problem of the current register. The current register is old and will most certainly reduce the number of legal ballots. I fear many people will be disfranchised, in what is likely to prove the most popular election of recent times. Interesting to see that the narrative which is emerging on the nature of the election is consistent with my initial interpretation of the constitution. We are headed for a presidential bye election and not a general election. I have always said, it is foolish to expect MPs to dissolve themselves when they are enjoying their gratuities, when they don't have to. The new President will most certainly have to serve until 2011 to re-establish the parliament and presidential cycles. Though that still remains unclear from constitution. If the President was to serve up to 2013, it would actually be good. Having the Presidential cycle out of sync with the Parliamentary cycle would not be a bad idea. It helps to keep the President on his toes! The Transport and Communication Minister Dora Siliya, has with immediate effect raised the international gateway license fees from US$12 million to $19.5 million, despite complaints from everyone, except Zamtel. The timing is poor and certainly will do nothing to make the gateway access more competitive. The increase makes Zambia the most expensive country in the Southern African Development Community and the East African region for private telecom investors to do business. Currently, the cost of acquiring an international gateway license stands at $214,000 in Kenya and at $50,000 in Uganda. In the meantime, the Zambia Consumers Association (ZACA) is now taking the Communication Authority of Zambia (CAZ) to task over difficulties in making international calls as a result of congestion at the Mwembeshi satellite station. Apparently the hapless Zamtel, which runs Mwembeshi satellite is failing to handle the large quantity of international calls made to and from Zambia. ZACA wants government to allow Zain and MTN to carry their own traffic and establish torrential links with neighboring countries in order to ease pressure on the Mwembeshi station. Read more here. The World Bank is joined by other institutions in paying poor wages to their Zambian security workers. The wages are clearly below the monthly Basic Needs Basket for a typical family in Zambia. Perhaps they are only employing single people! You can read more here. Angola is the latest country to follow Rwanda's example with implementation of the 30% rule in the upcoming elections - a third of candidates in the upcoming parliamentary elections are female, thanks to the government quota - read more here . The impact of the 30% rule on Rwanda is unclear, but the latest report suggests that the high presence of women in the Rwandan parliament has led to positive policy outcomes for children. If Angolan women MPs can have the same effect, I am sure future generations would be thankful, though I hope such quotas have "sunset clauses". Luanshya Copper Mines have announced that they expect to start producing 60,000 tonnes of copper cathode on schedule in 2009 at the new Mulyashi copper mine, which has a 20-year lifespan. The owners plan to spend some $350 million to build infrastructure and other related developments at the mine. The mining boom in Solwezi is bringing increase in economic economic activities, employment and infrastructure development. Its therefore not surprising that there's also another boon taking place - rise in prostitution, and with it the threat of a rise in HIV cases. Read more here. A fascinating letter in the Nambian on the Namibian Anti Corruption Commission that echoes the problem many countries in the region are facing with their watchdogs. Malawi's traders are apparently betting that maize prices will rise later in the year and are holding on to stocks, artificially pushing up the price at the tills for Malawian consumers. The government is not happy, and has promised to "clamp down on private traders hoarding maize at a time when people were in need of it, [and] would come up with a fixed price for maize to help poor households." Read more here. An interesting news item I forgot to blog last week! Apparently, the Tanzania government are contemplating re-possesing "all non-performing" privatised public firms. In other words, not all non-performing private firms, just the ones they sold!